Before I begin I want to thank Zer0_II for asking me to contribute to this month-long project. I look forward to sharing some demented, deranged and bone-chilling music here over the next few weeks. The first thing I'd like to share, while a bit demented, isn't really deranged or bone-chilling at all. 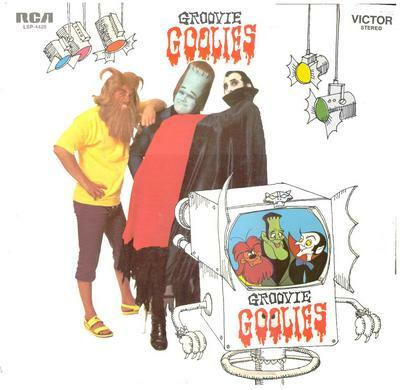 This is the soundtrack from the animated series Groovie Goolies. Originally known as Sabrina and the Groovie Goolies, Goolies was a spin-off of the Sabrina The Teenage Witch animated series that aired on CBS saturday mornings in the early 1970s. This is a children's comedy series, so it doesn't quite fit with the "all horror, all month" theme, but there was a Dracula, Frankenstein, Werewolf, Mummy, a Napoleon hat-wearing Skeleton and a character named Bella La Ghostly, so I think the Goolies are just horrific enough to make it.